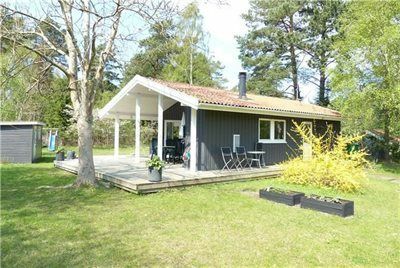 A beautiful 52 m2 summer cottage from 1996 lying on a 1200 m2 natural plot mid between Nykoebing Sjaelland and Roervig. Not far from the bird sanctuary Hov Vig and the activity park Sommerland Sjaelland. The garden is large enough for ball games and other kinds of activities. For infants there is a nursing pillow, a high childrens’ chair, a baby bathtub, and a tricycle. There is also a fully equipped picnic-basket. No pets allowed. Holiday home suitable for 4 persons . 2 of the beds is only suitable for older children (4-11 years). The holiday home is 52 m² and is build in 1996. No pets allowed. The holiday home has washing machine. Freezer with a capacity of 45 litres. Further more there is 1 wood-burning stove. For the youngest ones there is 1 high chair. The holiday home is situated on a 1200 m² natural site. Situated 1400 m from the sea. Nearest shop is 600 m away. You will find a golf course in a distance of 7600 m. A 25 m² terrace belong to the holiday home. Furthermore the house has a 30 m² covered terrace. Swing. Barbecue at your disposal. Parking place by the holiday home.